The Kairos booklet tells us that Coluccino is an Italian, studied classical guitar and composition in Milan and that he is also a poet. I have to confess that I’d never heard of him until seeing his name on July’s release sheet. I like to approach new composers with a completely open mind and it was in that spirit I selected ‘Emblema 1’ for my first encounter – at this stage I had merely read the composer’s bio – I played this piece before reading the analysis. One hears flute sounds which emphasise human breath drawn across isolated string notes. Sporadic bass-clarinet gestures provide something of an anchor. The phrases are very brief, sonic ‘coincidences’ – seemingly connected by silence. ‘Emblema 1’ continues in this vein for nine minutes – it seems much longer. There seems very little to allure or surprise or even involve the listener here. As is my custom, I repeat the work and focus my listening even more intently. There really seems to be nothing to connect these fragmentary combinations of sound. Just long silences. Is this the point? Is the silence the subject, and the sound the background? In ‘Emblema 3’ a similar sort of drama, or anti-drama is played out by a more intimate combination of flute and violin. The tempo is invariably slow, dynamics rarely go beyond piano and the silences again predominate. Given my experience of ‘Emblema 1’, the textures are exactly what I would expect from a flute/violin duo. I’m listening hard, but to what? I don’t really know. Again the piece seems to drag, and I adopt exactly the same strategy and repeat it. Apart from feeling the pain of the silences slightly more acutely, frankly I’m none the wiser. Time to get help. Firstly, hope against hope, I enter the name ‘Coluccino’ into the vast MWI search-engine/database. To my astonishment and delight there are three albums. They were reviewed by my estimable colleague ‘Byzantion’ – three releases from five or six years ago. (Readers can enjoy them again here, here and here) Perusing them carefully suggests that another pretty experienced pundit has encountered a similar brick wall. Not only that, but the introductory notes on these releases seem to have foxed my illustrious colleague, and as the present disc is on Kairos, I suspect their notes may also be a little, shall we say ‘obscure’. While ‘Byzantion’’s response to Coluccino’s art is to some extent reassuring, it is still pretty unusual for me to find myself flailing helplessly in the face of uncompromising new music, so let’s take a deep breath (with or without flute) and sample ‘Emblema 4’,scored this time for string trio. I really don’t wish to be dismissive, but the concept is the same – one waits for something to happen, not a great deal does; the fact that at roughly the halfway point a recognisable (if anonymous) four note motif that is played by violin and repeated by cello stands out in this landscape rather tells its own tale. ‘Emblema 4’ is effectively a primer for composers in mixing conventional string textures with silence. Perhaps ‘Emblema 6’ is the most distinctive of the series not least for its weird combination of bass flute, bass clarinet and cello. While this is probably the most static of all these pieces, the extended breathing and held notes do at times hint at an attractive coalescence of texture and harmony. Towards its conclusion some fleetingly interesting harmonic overtones emerge and dissolve. It’s a rare and all-too-brief passage of beauty in this cycle. There are samples from the scores of Emblemas 3 and 4 reproduced in the booklet which certainly suggest a real need for total absorption (and keen hearing) on the part of the performers – the excellent Italian Ex Novo Ensemble – who have featured on many superb discs in the past, notably on the Stradivarius label. The recording is forensic – as I would argue is absolutely essential with such quiet, slow, elusive music. Incidentally, there is an ‘Emblema 2’; the note tells us that this is a work for a larger (12 piece) ensemble and notwithstanding the practicalities involved its absence is apparently an artistic choice as the composer wanted to present a more ‘intimate’ album. A shame really – I would have been interested to see how Coluccino treated a larger group in this context. Kairos is one of my favourite labels and has provided me with countless rewarding encounters with some of the most engrossing and challenging music of our time. This disc, alas, wasn’t one of them. 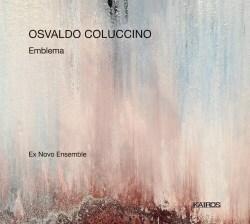 Osvaldo Coluccino may well have his adherents and admirers, but I’m afraid this reviewer found his music perplexing and ultimately rather dull.